David Fanning stated in his memoirs that this incident happened on March 12, 1782. Andrew Balfour's sister, Margaret, asserted it happened on March 10, 1782. Andrew Balfour was a justice of the peace in Randolph County and a Colonel of the Randolph County Regiment of Militia. He had tried to kill Col. David Fanning on several occasions, and his men had also captured and hanged several of Col. Fanning's men. After Col. Balfour attacked two of Fanning's captains (Capt. Walker and Capt. Currie) on March 7th [unnamed incident], the Loyalist commander decided to go after him and to kill every Patriot he could find. 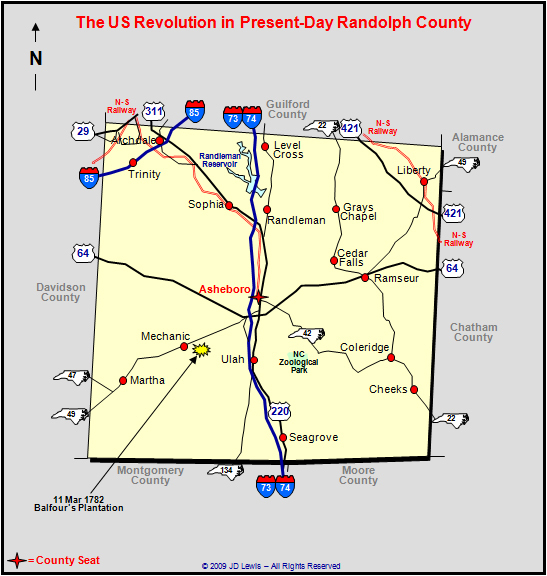 Col. Fanning raised twenty-five men on the night of March 10th and they rode the "Deep River Raid" against Patriots in Randolph County "in order to give them a small scourge." He and his raiders first rode to Col. Balfour's plantation. When they arrived, the Loyalists immediately opened fire. Absalom Autry fired at Col. Balfour and the shot broke his arm. Col. Balfour made his way back into the house to protect his daughter and his sister. The Loyalists rushed the house and pulled Col. Balfour away from the women, then riddled his body with bullets. Even Col. Fanning fired his pistol into Balfour's head. The women were kicked and beaten until they fled to the home of a neighbor. Col. Fanning and his men then rode to the house of William Milliken, who lived on Bear Creek, about two miles south of Johnsonville. Milliken was not at home so the Loyalists burned all of his buildings. Milliken's wife, Jane, carried a feather bed out of the house, but the Loyalists threw it back into the flames. Col. Fanning then forced Milliken's son to guide them to John Collins's house. He too was not at home, so they burned his house. The Loyalists then headed to the house of Col. John Collier. Collier was also an NC Senator and a Colonel for Randolph County and he knew that Col. Fanning was in the area. He had placed a young man named Benjamin Fincher on guard near his house. Fanning had his men to approach Fincher as if they were friends. When they were close, two of Fanning's men fired their muskets into Fincher's chest, but by some miracle both bullets simply bounced off. The stunned Fincher ran away. Col. Collier heard the shooting and ran out of the house. He was almost killed, but escaped with three bullet holes in his shirt. Col. Fanning then burned his house and outbuildings. Fanning continued this raid by riding to the house of Capt. John Bryant of the Randolph County Regiment of Militia, who lived near New Market. Col. Fanning talked both of Bryant's daughters into taking him to their father. He told Bryant to come out and to give himself up, offering his parole if the would so so. Bryant refused, yelling from the house "Damn you and your parole, too. I have had one, and I will never take another." Fanning ordered the house to be set on fire. Bryant asked Fanning to have mercy on his wife and children. Fanning replied that he would show mercy if he came out with his hands up. Bryant came out and said, "Here Damn you, here I am." Fanning's men shot him. One bullet went into his head and he fell back onto his wife. As Bryant's wife tried to raise him up, another Loyalist stepped up and shot him in the eye. Since he had killed the man he was after, Col. Fanning spared Bryant's wife and did not burn the house. He was weary from a long night's killing spree and he "lay down in the cradle, and after rocking himself there very comfortably for some time," rose and continued his raid. Swearing Creek, September 24th, 1782. I have just now received your very kind but sorrowful letter, dated May 22d; and it gives me a great of both pleasure and pain. I am extremely happy to hear from you; but as sorry, that it is on such a melancholy subject. You desire me to give you a particular account of your husband's death. My Dear Eliza, imposes on me a hard task; for the very thought of it throws me into such nervous fits, that it is with the greatest difficulty, I can hold the pen. Besides, I have not yet quit the bed of a long and dangerous fever, occasioned, I believe, by grief and vexation. However, to show that I really love you; I will comply with your request, but in as few words as possible. On the 10th of March, about twenty-five armed Ruffians came to the house with the intention to kill my brother. Tibby and I endeavored to prevent them; but it was all in vain. The wretches cut and bruised us both a great deal, and dragged us from the dear man then before our eyes. The worthless, base, horrible Fanning shot a bullet into his head, which soon put a period to the life of the best of men, and the most affectionate and dutiful husband, father, son and brother. The sight was so shocking, that it is impossible for tongue to express any thing like our feelings; but the barbarians, not in the least touched with our anguish, drove us out of the house, and took every thing that they could carry off except the negroes who happened to be all from home at the time. It being Sunday, never were creatures in more distress. We were left in a strange county, naked, without money, and, what was a thousand times worse, we had lost forever a near and dear relation. What added to our affliction, was the thought of his poor, helpless family left destitute, and it was not in our power to assist them. I wish his two families were united together. We would be a mutual help and comfort to each other; but whether it would be best that you should come to us, or that we should go to you, is out of my power to determin 'til I hear from you. Until then, I shall hire out my negroes, and go to Salisbury, where we intend to try the milliner's business. If there is good encouragement for that business with you, please let me know it, as soon as possible. If there is not, I beg you will come to us; and while I have a sixpence, I will share it with you. We are at present about ten miles from Salisbury, at Mr. James McCay's, where we have made a drop of corn. We remained only a few days on our own plantation, after the dreadful disaster, having been informed that Fanning was coming to burn the house and take the negroes. I will write you soon again, and let you know how we succeed in business, and I pray you will write immediately. Let me known how you are and whether you will come out or not. If you will not come to us, I will endeavor to sell out and go to you; for I cannot be happy, 'till I see my dear Andrew's beloved wife and little innocent children, of whom I have often heard him speak with a great deal of pleasure. I had a letter from my brother John's widow, who is at Charleston. It informs me of my father's death; and that his will remains in the same way it was when I left home. As it will be of some advantage to us; I propose going home as soon as circumstances will permit. Tibby joins me in love and compliments to you, and the dear little remains of our best friend. She will write you by the first opportunity. Andrew Balfour's widow, Eliza (née Dayton), was his second wife. His first wife, Janet (née McCormick), died soon after he left Scotland for America, and he remarried in Rhode Island and they had two children. Mrs. Eliza Balfour eventually made it to Salisbury on Christmas Day of 1784, where she was greeted by George Lucas, and soon thereafter cordially welcomed by many citizens of Salisbury. Soon, an arrangement was made for her to keep the Post Office at Salisbury, which she managed until around 1825. Tibby Balfour (daughter by his first wife) married John Troy of Salisbury and had three children. Col. Balfour's and Eliza's son, Andrew Jr., married Mary Henly, a Quaker, and they had nine children. Col. Balfour's and Eliza's daughter, Margaret, married Hudson Hughes of Salisbury, and they had two daughters.